No Midcoast Maine vacation is complete without some time spent on the water. Many visitors come to Boothbay Harbor, Maine, in their very own vessel. For those who don’t own a boat, embarking on one of the best Boothbay Harbor cruises is an excellent way to experience the sights and sounds of the Maine coast! Here are just five of our favorite Boothbay Harbor excursions. Boothbay Harbor cruises are only the beginning of what there is to experience during a trip to Midcoast Maine. For a complete list of the area’s best attractions, events, and activities, be sure to view our complimentary Vacation Guide! It has helped so many families plan unforgettable Maine getaways. A cruise that’s perfect for wildlife-loving families is Cap’n Fish’s Whale Watch, Boothbay Harbor’s original whale watching outfit. Cap’n Fish cruises are environmentally friendly and exciting ways to see the area’s many whale species, including the majestic humpback whale. With this company, visitors are 94% likely to experience a sighting! A truly unique cruise in Boothbay Harbor is the Audubon Puffin Cruise offered by the Cap’n Fish company. One of these tours is an entertaining way to experience sailing in Maine while enjoying rare wildlife sightings! A certified marine biologist narrates each trip, so prepare for an educational journey the whole family will love. Boothbay Harbor, Maine, puffin cruises are held between the months of April and August and include access to an on-deck restaurant! Nautical adventurers of all ages love trips aboard a Balmy Days Cruise! On one of these trips, visitors get to see the beautiful and historic Burnt Island Lighthouse. This lighthouse tour takes guests just one mile off the coast where perfect photo opportunities await! The cruise is $25 per adult and $15 per child (over two years old). Another fantastic option for lighthouse lovers is a cruise aboard the Schooner Eastwind! This magnificent 65-foot ship takes passengers out to see the Boothbay Harbor region’s remote islands, rocky shorelines, and lighthouses like the Cuckolds Lighthouse. A Schooner Eastwind signature sightseeing tour starts at $42 per adult and $25 per child. Set Sail from a Private Beach at Linekin Bay Resort! Families love embarking on sunset cruises and day trips from Boothbay Harbor, but at the end of the day, nothing’s finer than coming back to your very own private Boothbay Harbor beach! All lodging at Linekin Bay Resort offers easy access to the property’s docks and open shoreline, which are perfect for mooring a boat or going kayaking. It’s an ideal place to bring the family for an all-inclusive summer vacation full of adventure and relaxation! We even offer a kids’ camp to keep the little ones occupied. The Linwood Lodge is an incredible place to rest your head after a busy day of sailing Boothbay Harbor. As one of our finest waterfront lodges, the Linwood Lodge overlooks stunning Linekin Bay. 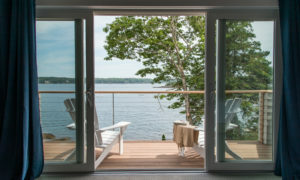 Each of its 14 rooms boasts a private deck and incredible views! Ready for the ultimate coastal getaway? Check our availability today and start planning!